Above everything else, hamburgers are our favorite food. They have been for as long as I can remember eating food. They have both a versatility and a simplicity. It’s something everyone can have—after all, it’s all four major food groups within one hand’s grip—yet they can be paired and prepared in so many unique ways. One of the great things about Charlotte is that there is such a great variety of burger experiences here. We have traditional burger joints—places that have been here since the 50’s—but we also have new restaurants popping up every week with chefs developing new and challenging recipes. You can eat burgers five days a week and never feel you’re repeating yourself. That’s why we started this blog. We’re not real food critics—we have no training or any type of culinary education. But we know what we like. We like burgers, and we love this city. And we’re trying to try all that Charlotte has to offer. If you live in the Queen City and like burgers too, then maybe you’ll be interested in what we say. At (nearly) every restaurant we go, we’ll weigh each burger, measure its height and diameter, note the cost and if they cook the burger to order. In addition we’ll discuss the overall taste of the burger, the restaurant’s atmosphere, and their beer selection. We’ll try to update our blog with a new review of a restaurant as often as possible. Please feel free to suggest a restaurant for us to visit, a person for us to interview, and let us know what you think of our reviews. We’d love to hear your feedback. One thing we should note, though. 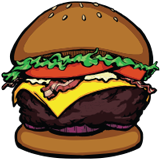 Many people may have found this website looking for “The Best Burger in Charlotte.” We don’t think that there is such a thing as “The Best Burger in Charlotte.” After all, if we were to eat a burger and truly think it was the best, there would be no reason for us to continue. It’s all about the journey. We’ll have our favorites, and you will too. But we could never narrow it down to just one. Now if you’ll excuse us, we have some ground beef to consume.